Around this time of year, it’s understandable for your style to get a little, shall we say, sleepy. It’s cold. It’s dark. You’ve got things to do that don’t exactly demand flashy attire, like going to the gym or your accountant’s office (ugh, taxes). But think for a moment about how good it feels to break out of that boring old routine when the weather gets warm, how downright euphoric it feels to leave your house wearing nothing but a look-at-me outfit and a fresh smile. While we can’t make the warm weather arrive sooner, we can teach you a style trick for bridging the gap between the seasons. Namely, to incorporate bold color into your wardrobe in order to give it a spring lightness without trading off on warmth or practicality. Our current obsession: olive green and soft pink. There’s something about olive’s military connotations and pink’s inherent preppiness that comes together in the coolest of ways. And the pairing is surprisingly easy to pull off, too. Whether you’re on or off the clock, doing big things or just trudging your way through your to-do list, this color combination will revive your style in no time. Here, three ways to wear it now. Adopt them all and you’ll be surprised how quickly spring comes around. Once you own suits in all the basic colors—black, navy, gray, and tan—olive green is great next step. The tone is unexpected but sophisticated, helping you stand out at work for the right reasons. Wearing a light pink dress shirt underneath eases the winter mood without getting too carried away. 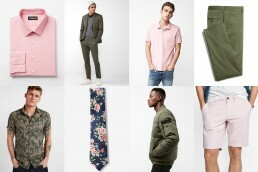 Marry the olive and pink colors together with a floral tie that uses both hues or let the combo stand strong on its own. Surprisingly enough, you can’t really go wrong here. Military green chinos or jeans are unimpeachable weekend wear, but that doesn’t mean you should let your style get stale. Try a T-shirt or polo in soft pink for a change of pace that doesn’t complicate your bed-to-brunch game in the process. All you need to complete this look is a pair of simple sneakers and a coat to keep warm. Bonus points if the topper is also olive green to keep your fit looking extra modern. Planning some tropical PTO? You have our permission to bring this stellar color combo with you on vacation, and even turn the volume up while you’re at it. A pair of pink cotton shorts has chill vibes written all over them, as does a tropical print shirt in olive tones. Wear these stylish and laid-back pieces together and—boom—you’re the best-dressed guy in your beach town. Our only request: Finish the look off with streamlined sneakers so that your outfit is sober enough to keep you out of trouble.